Everybody wishes to invest their money in such an asset class where besides being safe, it generates returns that outperform the normal bank FD rates. But the basic question that arises is “How?” What to do? The answer to this is trading. Trading is one of those options that lets you generate money which though is little unsafe but can generate lots of money. For achieving this, one needs proper guidance and knowledge which is not only reliable and practical but is also certified by a valid authority. In India, NSE is that authority which provides certification in certain courses and there are even many institutes which provide learning on different aspects of financial/capital markets. Trading can be best done with the help of technical analysis. 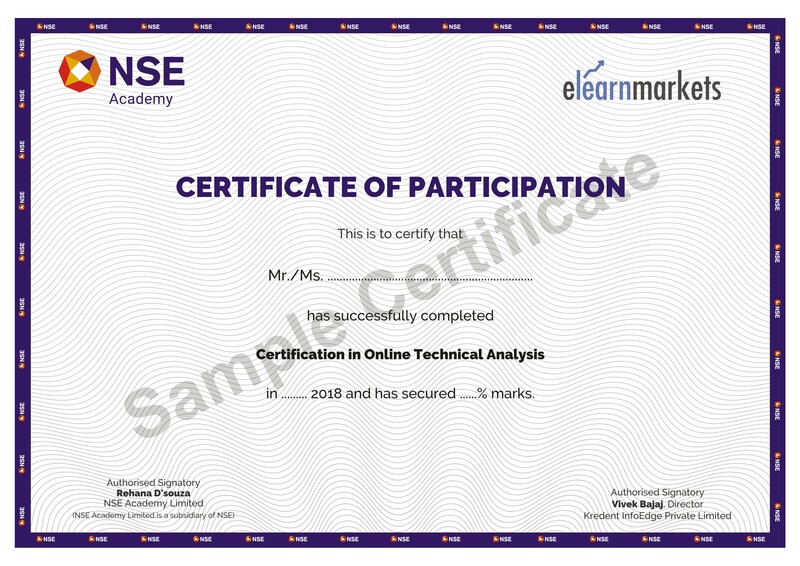 Hence, the course specifically on trading is called the NSE Academy Certified Technical Analysis Course. Where can I learn this course? There are many institutes that provide knowledge and detailed learning on this aspect of financial market. One such institute is Elearnmarkets, the online education arm of Kredent Academy that provides both theoretical and practical knowledge on technical analysis. What is the reliability of the course? As we all know that NSE is the leading stock exchanges in India and fourth largest in the world and since this course is certified by NSE, it makes it a very prominent and reliable course to study and invest money in. One very important thing to note here is that NSE also gives certification in such courses, i.e. it provides certificate to every person who takes up its examination and qualifies it. The certificate provided by NSE has a validity of 5 years beginning from the date when he/she qualifies the examination. Elearnmarkets.com is India’s online financial education provider. The main vision of the company is to spread financial literacy in the whole country as well as abroad. With this aim in mind, the company is constantly experimenting with new education methodologies and technologies to make financial education convenient and accessible by all. Not only that it provides financial literacy but it also helps its students in providing a platform for job opportunities and helping professionals for better career prospects. This entry was posted in Trading Ideas. Bookmark the permalink.